We like to do a garden every year. We grow mostly chili peppers, shocker I know, but we also grow a number of herbs and a large variety of tomatoes. Like frersh chili peppers, fresh tomatoes are great to work with. We both love being able to just walk out to the garden and pick most of the ingredients for that night’s meal. the problem, though, is the crazy overabundance of produce. If you’re like me, you plant as much as you can and you hate to see any of it go to waste. We give some of it away, but what I like even better is preserving. There are many ways to preserve – see our chili pepper preserving section for some of that info – but here’s a simple method: Making Basic Sauces. Making basic sauces is super simple. In general, you toss a bunch of tomatoes and peppers with whatever herbs strikes your mood, cook them down, and process and freeze them. I’ve done this with both a large pot on the stovetop, but also in a pressure cooker which works much faster. Some people swear by the pressure cooker and even feel the pressure cooker imparts even greater flavor. I haven’t noticed a difference, but I can certainly vouch for the speed of it. I can cook down a huge batch of tomatoes and peppers in 30 minutes, not including warm up time, whereas on the stove it can take well over an hour. Either way, it works wonders. Here are some simple steps, along with options, to make your own homemade simple sauces for freezing. I typically have as many chili peppers as tomatoes, so I enjoy a 50-50 ratio. I also prefer to have a variety of heat levels on hand, so I will separate the milder peppers from the hotter ones, usually by heat level, and mix and match accordingly. In the end, I will wind up with a few quarts each of mild tomato-pepper sauce, medium tomato-pepper sauce, and hot or superhot tomato-pepper sauce. You don’t have to season if you don’t want to. 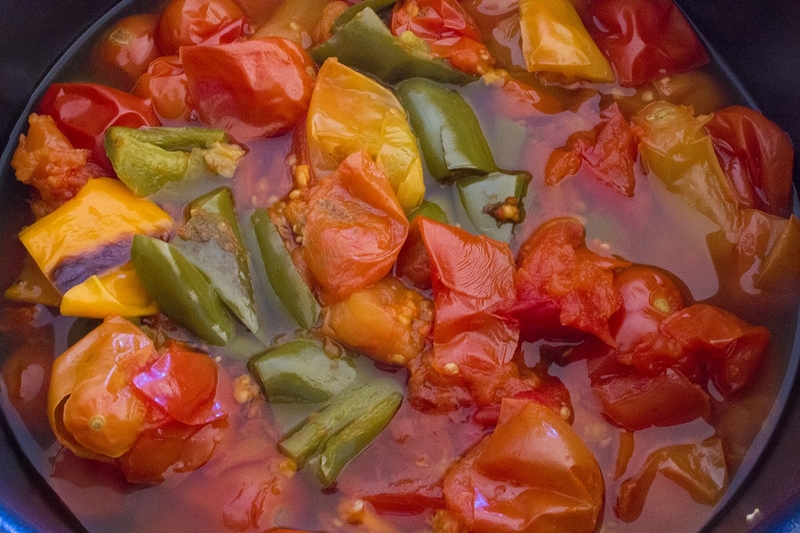 In fact, you may want to use only tomatoes and peppers so that you can season the sauces later. This is a good idea since these are really only meant to be a base for you to make your sauces, soups or stews later on. Since I typically grow a LOT of basil – don’t you just LOVE fresh basil? – I will make a few batches with basil tossed into the pot for cooking. Also, salt is usually good. If you’d like, you can cook up batches of pasta sauce this way by adding basil, garlic, and more. Go for the gusto, or just keep it plain. As mentioned, just toss it all into a pot and cook it down on the stovetop for an hour or longer over medium heat, stirring occasionally. Once everything has cooked down to a mush, you can move on. Or, try the pressure cooker. I got mine done in 30 minutes and boom! I transfer my cooked mixture to a large mixing bowl and process it all down with a stick blender. The stick blender rocks. Seriously. No need to transfer batches to and from a food processor or blender. That method works fine but can be messy if you’re like me, a mess maker in the kitchen. I try to be careful, I swear, but stuff just leaps everywhere and I have no idea why. 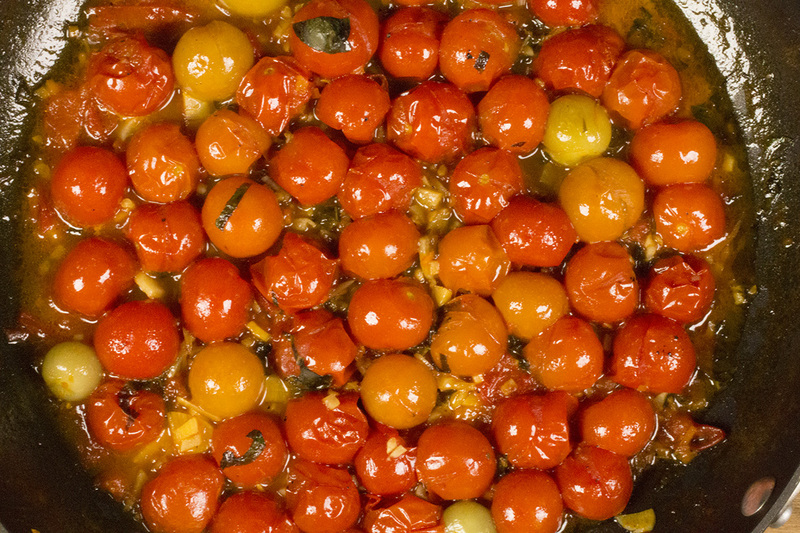 You can always strain later, but you will have the tomato and pepper skins in the sauce. I see no problem with this, but some people don’t like the skins, as they can float in the final product. You can, of course, skin the tomatoes and chili peppers before processing, but that adds quite a bit of time. You can push them through a food mill as well. I normally don’t strain and just use the stick blender. It comes out quite smooth. However, if you’d like to use your sauce as a base for tomato soup later on, strain it through a thin strainer and you will get some really smooth base. In fact, if you tossed in some basil and garlic with your batch, you prertty much have some awesome tomato-pepper soup already there. At this point you are done. Just transfer your sauces to freezer ready storage jars and freeze. Make sure you have enough space to keep them! When you want them throughout the winter, just pull one out, thaw, and go to town with your recipe. That’s it. If you have any other ideas, please share them. I use mine all winter long for soups, stews, chilis, and more. Just finished this method for tomato pepper sauce. It turned out great – spicy and flavorful. Thanks for this easy way to process some of my garden goodness.